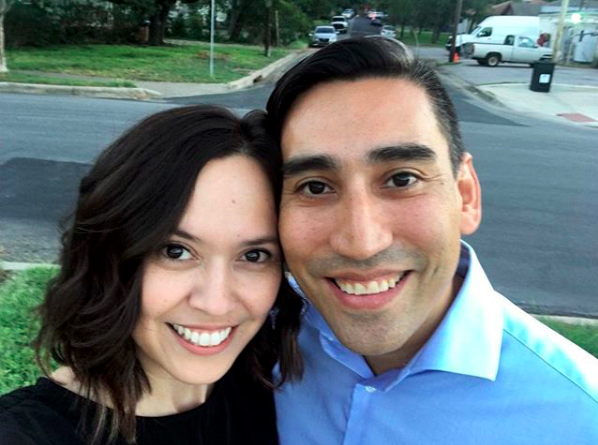 This week Justin and I attended FINO’s event, a smashing happy hour on their gorgeous patio. Now, I should preface this by saying that I already love FINO… the breezy but classy patio, the inventive cocktails, the tasty small plates for sharing. So the blogger event was just icing on the cake. The folks at FINO treated us like kings and queens. There were four different cocktails served throughout the night, and over ten food tastings, all brought out by knowledgeable waitstaff. 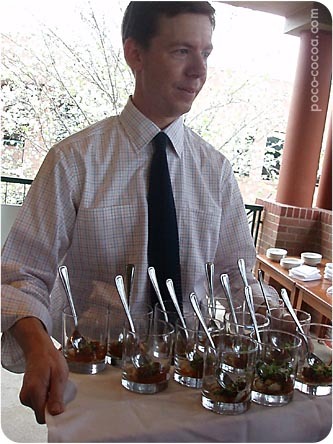 We were even able to talk to Brian Stubbs, the General Manager at FINO, who was so gracious and welcoming, as well as Emmett Fox, the chef behind FINO and Asti Trattoria. 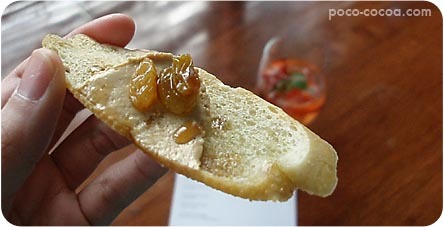 We started with crisp foie gras bruschetta topped with golden raisins that had been plumped with sherry. Now I have to be honest and say I’m the weirdo who’s not a fan of the richness of foie gras, but this was still delicious. There was a nice balance of the crunchy and sweet, so I wasn’t focused on the fatty and smooth. 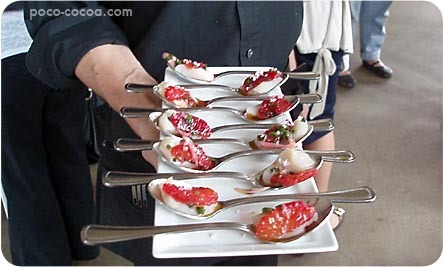 We also were served strawberry & mint sangria (in the background), which I absolutely loved. The sangria featured Poteet strawberries (remind me to tell you our Poteet strawberry festival story sometime), white wine, brandy and prosecco. 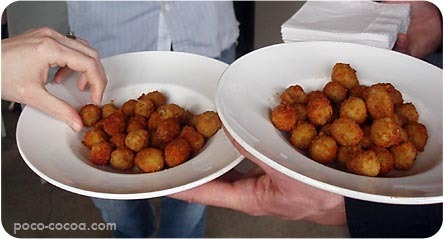 Next up we had Justin’s favorite thing on the menu… fried anchovy-stuffed olives. 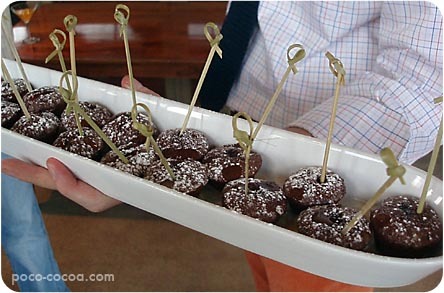 You may remember that I am not an olive fan, but these were delicious. They were salty and crunchy, and tasted more like olive oil than olives. By the way, FINO really knows how to fry. 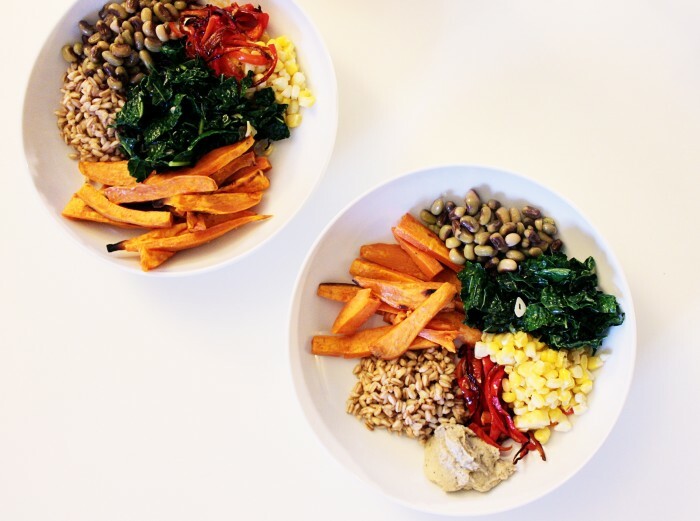 Just wait until you see the fried goat cheese. The tomato gazpacho was fresh and perfectly seasoned. It reminded me of the gazpacho recipe in the French Laundry Cookbook (the one recipe I’ve actually made from that book). 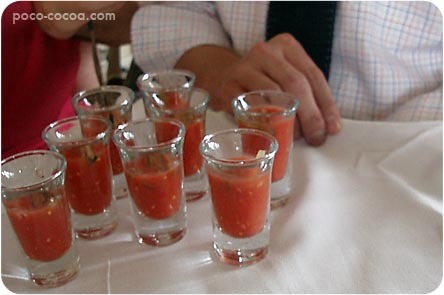 I must have had four or five of these shot glasses of tomato goodness. By now we were done with our sangria, and it was time for new cocktails. The next two were not my favorites… I’m sure they are stellar cocktails, but I personally don’t like flowery flavors (rosewater, lavender, etc. ), and they were both rather flowery. Justin loved them, though. In front (all blurry, of course) is the Paloma Flower, a mix of tequila, elderflower liqueur, grapefruit and grapefruit bitters, topped with foamy egg white. In the background is the Bee Sting, made with honey vodka, black pepper syrup and lemon-orange juice in a tequila-rinsed glass. Aaah, the fried goat cheese. 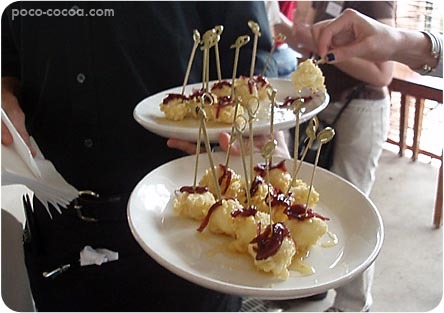 One of my favorite things about Austin is FINO’s fried goat cheese. I think that’s been on the menu since day 1, and there’s no removing it because it’s just so freakin’ good. 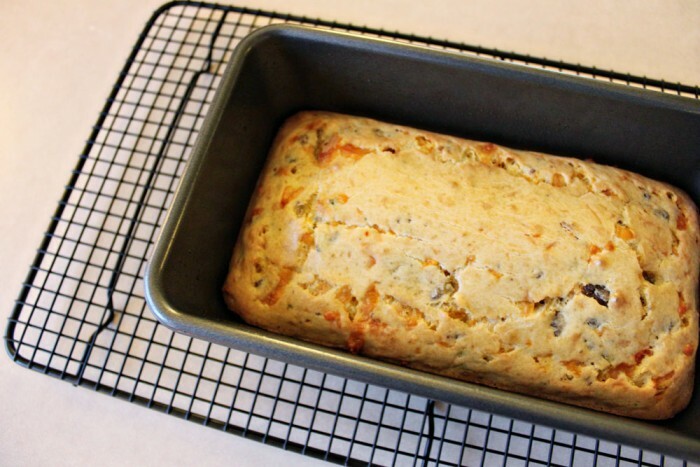 It’s topped with onion jam and honey. Sigh. These lovely spoonfuls were so good. Raw scallop topped with blood orange and sea salt… the texture of the scallop was lovely, and the sweet/salty orange with salt was a perfect complement. 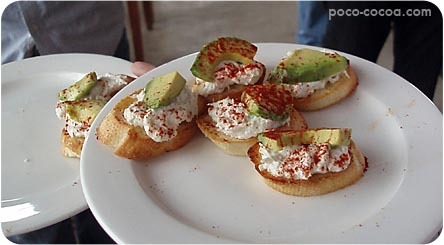 The crab and avocado bruschetta was probably my least favorite of the dishes. It just seemed a bit too… boring. Or bland. I’m not sure what it needed, but it just seemed lacking. I still ate it, though. 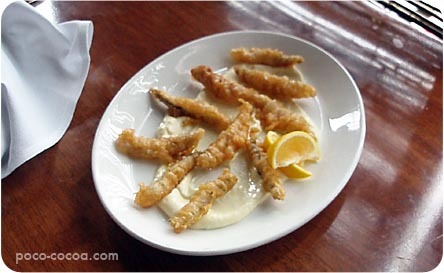 A nice off-the-menu surprise was this plate of fried white anchovies with aioli. Not for the anchovy-hater, of course, but I thought they were salty and fishy and lovely. So I was antsy, antsy, antsy, because I saw pork belly listed about halfway down the menu and could not WAIT to eat it. I love me some pork belly. It came in spoonfuls with white bean puree and spring onions, and my only complaint is that I couldn’t eat seventeen spoonfuls. 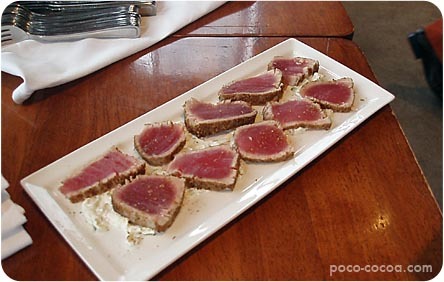 The coriander crusted tuna with mint tzatziki sauce was good, but no more impressive than most seared tuna dishes. I do love tzatziki, though, so I had a few of these. Or six. Whatever. 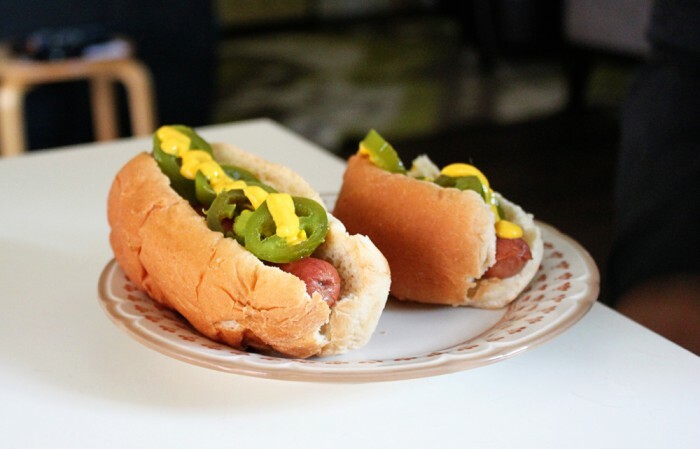 Now these little babies… oh, my they were good. 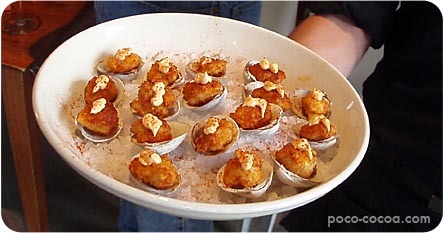 Of course, anything that FINO fries is good, but these littleneck clams with paprika aioli were especially so. Plus, it’s fun to eat things off the half shell. It makes you feel important, like you’re a 1940’s Hollywood starlet. Slurp slurp. Justin was too busy chatting and missed this tasting, so I spent all night telling him “they were so good” and “I can’t believe you didn’t taste them” and “man, I feel so bad you didn’t get to try those.” Poor guy. 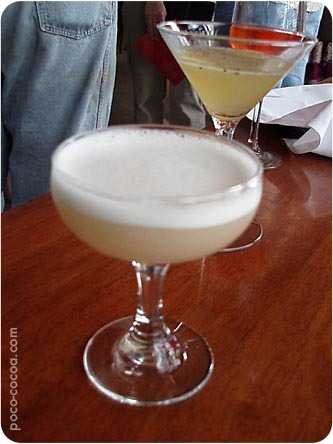 The last cocktail was the Irish Monk… a mix of whiskey, chartreuse, Earl Grey syrup and lemon. I didn’t know I liked whiskey, but apparently, I love it. In this cocktail, anyway. Unfortunately for all of us, I didn’t get a picture of it before I gulped it down. I did, however, get a picture of Brian Stubbs, the General Manager, in his AMAZING outfit. You can’t see them in this picture, but Brian’s wearing orange pants. Guys can be stylish and cool in vintage! Who knew?! Even more fabulous, Brian is carrying a tray of one of my favorite dishes of the evening: Za’atar braised lamb with celery root puree and micro arugula. Holy. Moly. I scraped that glass clean, and then stole another when someone wasn’t looking. Sorry, someone. For dessert, the chef made us strawberry cocaine. Seriously, people, it was fantastic and addictive. I’d like to eat it for every meal for the next month. 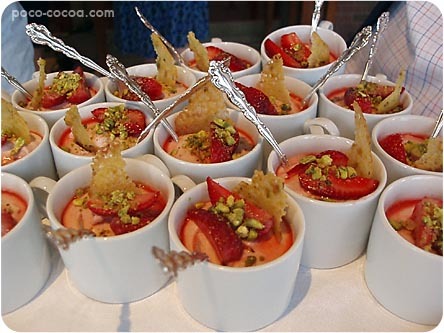 Strawberry semifreddo with rose water coulis (I know! I don’t even like rose water! But it was good! ), pistachios and a pistachio tuile. It tasted like a childhood summer. Like picking strawberries at the farm. Like heaven. I’m usually a chocolate kind of girl, but I would choose this over many of the chocolate desserts in Austin. It’s THAT good. I have to say, I was re-impressed with FINO. It had been a while since we’ve been there, and now I’m itching to go back. Did you know they serve lunch? Wouldn’t that be a lovely way to get out of the office in the middle of the day? You could sit on the patio and munch on tapas and dream of being on the Mediterranean Sea. I plan to do that very soon.